I'm working on a little something for April First...here's a tidbit that should whet your appetite until then. It's a mystery side...the only thing I'll say is that this record has a connection somehow to the Attleboro Area (but there might be another little clue somewhere else). What's the connection? Who's on the record? Title? ...and 'til the First of April, as Neddie Seagoon often said... "Needle Nardle Noo!" Recently, some malicious twerp decided to wreak havoc with my blog...first by jeopardizing my good relationship with Box.net (by complaining about copyright infringement), then by hacking my blog and removing one of my posts. Not just any post, mind ye, but the one I spent the most time on...this one. I'm glad that Google cached a copy of it somewhere, so that I was able to reconstruct the page within an hour or two. Recently, several jazz blogs have posted tributes to the late Blossom Dearie. Some of them even featured an album or two. I even saw the album she did for Hires Root Beer (a little blurb on it here: http://en.wikipedia.org/wiki/Blossom_Dearie_Sings_Rootin%27_Songs ) in one of those blogs. But I've never seen this Hires Root Beer-related item in any other blog...shoot, I've never seen another copy, period! 1963: Blossom Margrete Dearie, vocal & piano; Ernie Royal, trumpet; Jim Hall, guitar; Eddie DeHaas, bass; Frank Gant, drums. 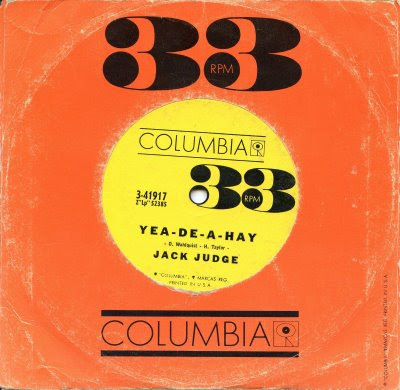 This little seven-inch 33 was apparently given to grocers who stocked Hires. On it, there's an announcer who talks with Ms. Dearie, who sings the jingle a couple of times and talks about the recording session. 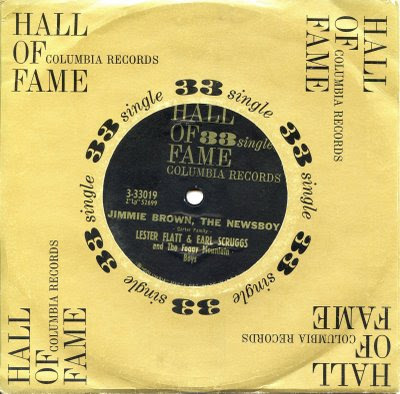 Mention is also made of the advertising campaign that Hires was going to start soon.Interesting note...the personnel on this record (and the ads) is not the same as the Hires-promoted Sings Rootin' Songs album mentioned earlier. The flip side of this oddity is just an extended version of the music behind the Hires ads that were about to get airplay. Here are some other unusual seven-inch 33s. Actually, I had already planned to post a bunch of pre-1964 stereo 45s, and a few of the Stereo Seven singles that Columbia produced from 1959-61. I just added the Dearie record as an audio appetizer. 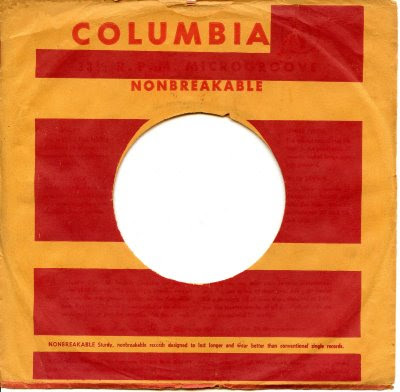 Let's start with the early mono 33 singles that Columbia produced from 1949 to 1951 or so. This was the infamous War Of The Speeds...RCA had recently introduced the 45 rpm record and a fast-changing machine to play them. 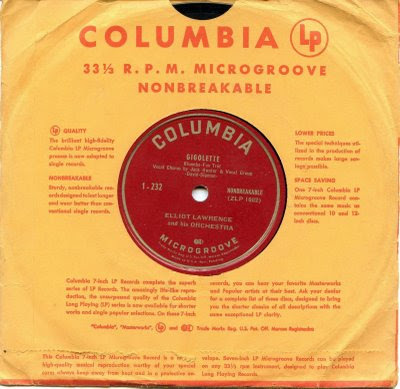 Columbia developed the microgroove 33 rpm record (yeah, I know that Victor's Program Transcriptions from the early 1930s also ran at 33 rpm, but they weren't microgroove. And they didn't sell particularly well. Nothing did at the time.) and a new phonograph for these as well. Anyway, from 1949 through the early 1950s, there were some odd formats for records available...ten-inch LPs, extended-play 45s (available both singly or in multi-disc sets), big clunky box sets of 45s (ever see a complete opera on 45s? 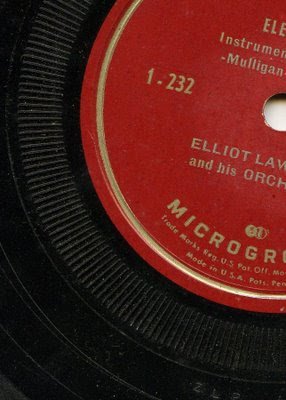 It's almost as bulky as an opera on 78s, only lighter), and these little 33 rpm singles. 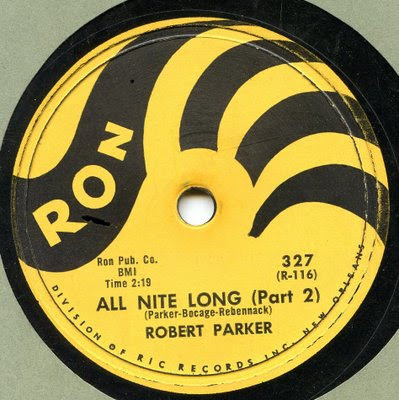 Once the smoke cleared, it became evident that the public preferred LPs for longer pieces or collections of songs, and the 45 rpm speed for shorter pieces. These "little LPs" seem to be the scarcest format...I don't run into them too often. 1949: Large orchestra, with Gerry Mulligan, baritone sax and arranger. I'd imagine that the heavy tonearms of the period caused these records to slip, especially when stacked. Columbia added a novel feature...a knurled band around the label to prevent slippage. 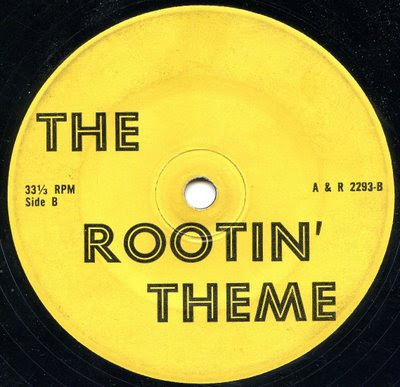 Anyway...I have six or seven of these records, but there's nothing all that unusual on them...a few pop sides of the period that were issued more-or-less contemporaneously with their 78 rpm versions. There were also a few reissues of big sellers that were already in the catalogue (Ellington's Stormy Weather, Billie Holiday's Am I Blue? and a couple of others).After a couple of years, it became evident that this format just wasn't selling. So it was scrapped. But what to do with those "Microgrove" sleeves they had already printed? A brilliant idea! 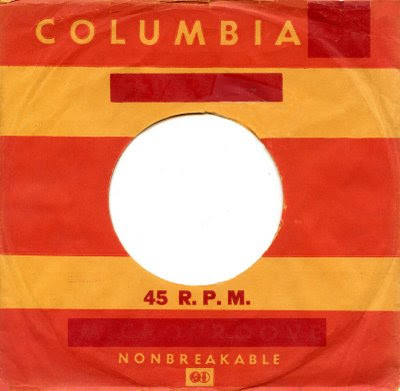 Columbia merely blocked out any reference to the original use of the sleeve and stuck 45s in them! Did Columbia really think they were fooling anybody? These retread sleeves are really strange-looking...and they're quite scarce too. Now...let's fast-forward to 1959, shall we? Stereo records were introduced the year before...they're slowly building an audience. But there were also remnants of an economic recession (one of the contributing factors to the demise of Ford's Edsel division, but this is a music blog, isn't it? Forget I mentioned the Edsel.). Anyway, the sales figures of 45 rpm singles was down over thirty percent. Most of the companies tried 45 rpm stereo singles to improve sales. More on these oddities in a future installment of the Sanctum. 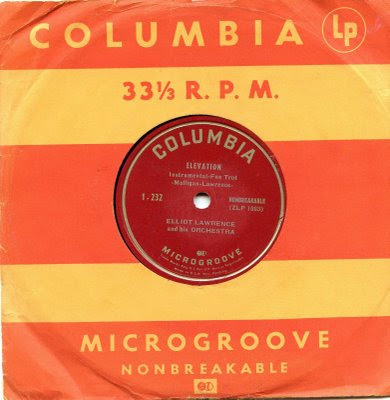 Instead of stereo 45s, Columbia dusted off the "little LP" idea again, added stereophonic sound, and viola! er... voila! The Stereo Seven was born! 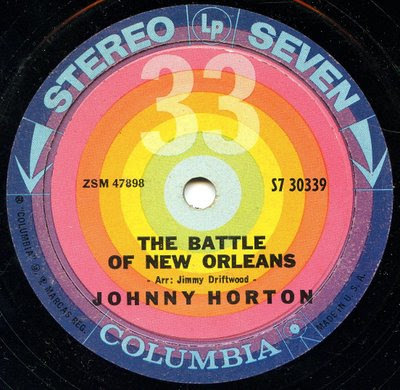 1959: Johnny Horton, vocal; Jimmy Driftwood, composer & arranger. 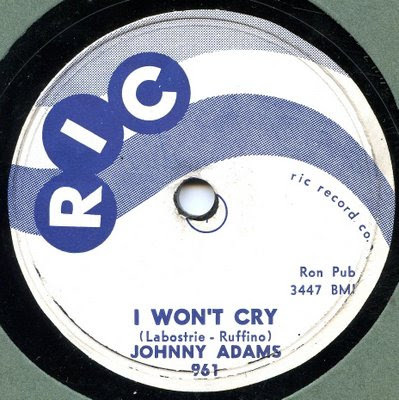 This song went to #1 on the charts in April 1959...at least the mono 45 did, anyway. I can almost hear the average record collector saying "but these are jukebox records!" Well, yes and no. We'll get to the jukebox issues momentarily. This is a completely new kind of record combining two great innovations -- the convenient 33 rpm LP speed and exciting Stereophonic sound. You can play this record interchangeably with your 12-inch stereophonic LP albums. It is one of many new STEREO SEVEN releases available at your record shop. Here's another example, complete with its fancy shiny black sleeve! Hollywood, 1 June 1959: Large orchestra featuring Duke Ellington, piano; Jimmy Hamilton, tenor sax; Ray Nance, trumpet. 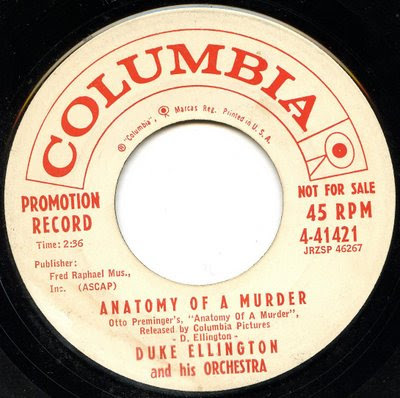 Oh, the Ellingtonians out there might be interested to note that this particular take of the Anatomy theme is unique...it's different from the takes issued on the LP and the 45! If you'd like to compare it to the 45, here it is! Hollywood 2 June 1959: Same. Well, now...I suppose I should mention that there was indeed a series of these Stereo Seven singles intended for the jukebox trade too. Notice there's almost no difference on the label between this and the two previous examples. Ah, but there is something different...a JS7 (Jukebox Stereo 7) number at the 9:00 position that the home-market issues don't have. 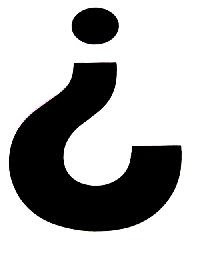 And there's a JB suffix on the matrix number as well. These were issued in five- or six-record sets (often with an "Album of the Week" notation on the box), each disc containing a pair of cuts to the particular LP that was being issued in this format. These records came in the same fancy sleeves, but the blurb about buying Stereo Seven records at the shop is missing. The single-song Stereo Seven was allowed to die. Around this time, though, most companies that produced stereo singles for the jukebox trade expanded their playing time to around ten minutes per side...these could be played for a quarter each...saving the customer a nickel over the price of three individually-chosen songs. Columbia was no exception...they produced quite a few of these longer-playing Sevens...but the label was a lot plainer. A snazzy label couldn't be seen inside a jukebox, unless the customer was a mild-mannered reporter named Kent (take that, comic fans!). 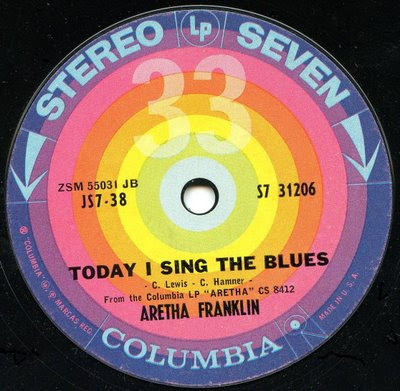 Here's a bit of one of those records...again by the Queen of Soul (in waiting). 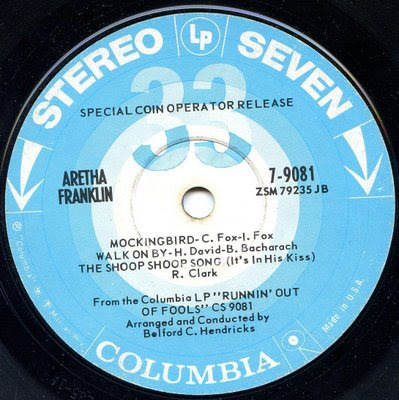 This cut sounds like Columbia was trying to groom Aretha as their answer to Dionne Warwick. But wait! There's more! These are more seven-inchers, but they're mono! It seems that someone at Columbia (probably Goddard Lieberson) was nostalgic for the Good Old Days when there was only one speed on the market (78 rpm, of course). He thought he could win the public over to 33-rpm singles, hoping to eventually phase out the 45 (remember, that was originally an RCA product!). I've seen very few of these yellow-label records...and for some reason, they all had a promo sticker on one side. It could be a coincidence. Both of these records also came out in the 45 rpm format, using the same catalogue number, but using a 4- instead of the 3- prefix. And both have the LP designation in the matrix number in quotation marks. I'm rather grateful that these mini-LPs didn't take off. When one is looking through a handful of 45s, it's much easier to stick a thumb through the big holes of a 45. I was asked recently what were the latest 78s I owned. I replied that I had two of the three R. Crumb ones and a special Leon Redbone promo from 1978. But those were special "retro" issues. The latest ones I have for general release are a pair of goodies from the Ron/Ric labels from New Orleans...both are from 1959. Dang...R & B singing just doesn't get much better than this...I Won't Cry was The Tan Canary's first hit. As late as these are, the Fury/Fire company issued 78s even later...as late as 1960 (anybody have Bobby Marchan's There Is Something On Your Mind on 78? It exists! )...but they're scarcer than honest politicians. Canada pressed 78s until 1961 or 1962, and other countries (especially India and the Philippines) continued for a few more years...that's why there are 78s by latter-day acts like the Beatles. That'll do it for this installment...beware the Ides of March. 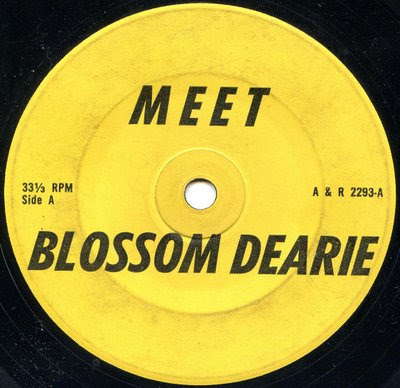 Absolutely outstanding post - not only had I never seen the Blossom Dearie promo, I didn't know it existed! Thanks, Buster! I'm glad to see that people are watching the blog...Keep up the good work on those ten-inchers! Oh, how do I get invited to check out your other blogs? Luis...I had always assumed that Columbia had issued the same take on both the LP and the stereo single, as well as the 45. 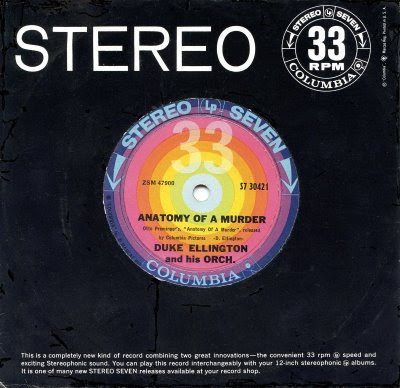 However, according to the liner notes on the Sony CD and the Ellington Panorama online discography, the take issued on the stereo single (RZSP46267-9) was recorded the day before the 45 rpm version (RZSP46267-14) and the version on the LPs (RZSP46267, no take listed in the Panorama). Has the Ellington Society or similar group actually disproved this info? I know that CBS/Sony is famous for supplying wrong info from time to time, but I've heard the Panorama's discography is fairly accurate. I have copies of the LP (original stereo and a promo of the mono one), and will sit down someday and compare the solos.In any case, thanks for writing! Back to the hacker...why do idiots like this ransack blog pages? For the same reason they troll in chat rooms, looking for people to boot. BECAUSE THEY CAN. I can think of another question that's answered by "because they can." The question is about a grooming procedure of canines...I'll bet that our little hacker friend does that too. Regularly. When he's not hacking and hiding, that is.